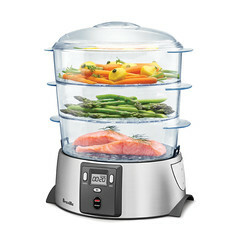 The Breville Digital Food Steamer™ — Cook smarter without oils or unnecessary additives and let your food’s natural flavor shine through. Full steam in 30 seconds. Three large trays for steaming different dishes at the same time — from rice to vegetables to fish. Easily refill the reservoir while in use. Boil Dry Protection prevents overheating when water runs out. 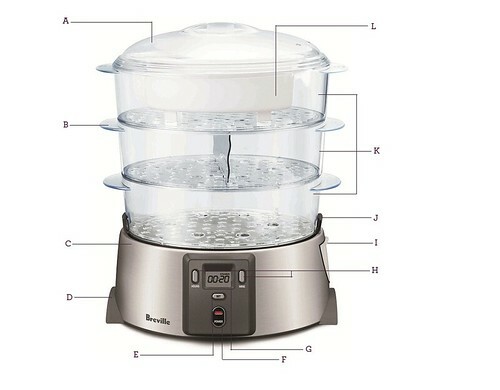 Automatic Timer and Keep Warm function gets food tender and keeps it ready. A. Steamer Lid. B. Ergonomic Handles. C. Steamer Base and Water Reservoir. D. Non-Slip Feet. E. 'SET' Button. F. 'POWER' Button. G. Control Panel/LCD Screen. H. Hour/Minute Buttons. I. Water Level Indicator. J. Drip Tray. K. 3 Stackable Baskets with Removable Bases. L. Rice/Sauce Cooking Bowl.